To Thrive, Many Young Female Athletes Need A Lot More Food : Shots - Health News Doctors and parents often miss the signs of female athlete triad syndrome — low energy, low bone density and irregular menstruation in an otherwise healthy-looking girl or teen. Regan Detweiler, training in February 2014 in Columbus, Ohio. A rigidly low-carbohydrate diet in high school left Detweiler vulnerable to stress fractures, doctors say. She's eating better now — and feeling better, too. Participation in sports by girls and young women has soared in recent decades — by 560 percent among high school students since 1972, and 990 percent among college students, according to the Women's Sports Foundation. Highly committed young female athletes now run track and play soccer, basketball, water polo and other demanding sports that require strong bodies. But many girls aren't eating enough to satisfy the physical demands of those sports, scientists say, and that's putting them at risk for health problems that can last a lifetime. These athletes are essentially malnourished. The danger they face is called female athlete triad syndrome because it typically includes three symptoms: irregular menstrual cycles, low energy and low bone density. Doctors once looked for this constellation of symptoms only among "anorexic, very skinny" young women, says orthopedic surgeon Dr. Elizabeth Matzkin, chief of Women's Sports Medicine at Brigham and Women's Hospital in Boston. But experience has since shown, she says, that "these athletes can come in any shape, form or weight. It's not just that typical ballerina physique that we're looking out for anymore." Unfortunately, she says, many primary care doctors still don't recognize the syndrome and most of these athletes don't know they're at risk. Take Regan Detweiler, a University of Michigan sophomore. She ran track and cross country in high school, and used to train all year long — running, on average, 35 to 40 miles a week, she says. Detweiler also adhered to a rigid, low-carb diet — she says she had a "very unhealthy relationship" with carbohydrates. Breakfast for her in those days was coffee and a cup of yogurt. Lunch was a peanut butter sandwich, minus the crust. "I was eating as little of that peanut butter sandwich as I could possibly eat," she says, "while still saying I had a sandwich for lunch." Dinner was a small serving of meat and vegetables. Detweiler says she was hungry pretty much all the time, and often felt tired in the middle of the day. She menstruated only once every six months or so. Then, during her sophomore year in high school, Detweiler suffered a stress fracture in her right shin. She took a month off running and wore a protective boot. 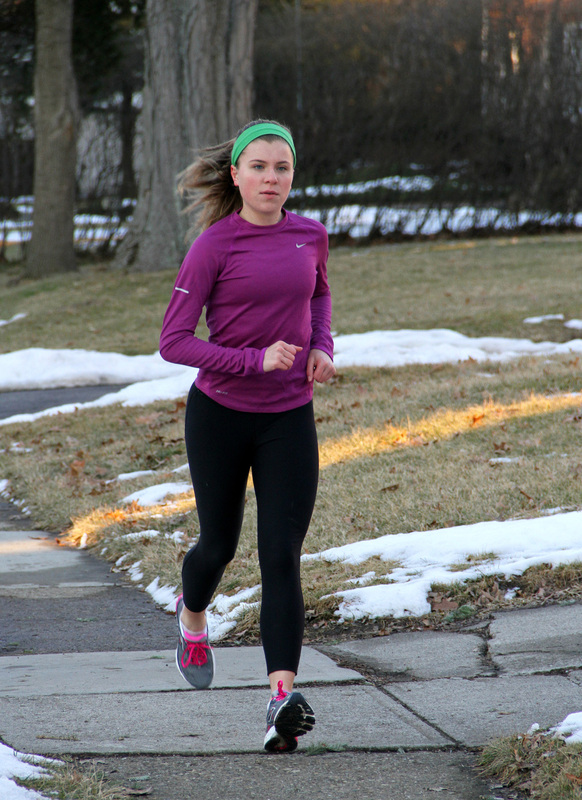 But during her junior year, she suffered another stress fracture — this time in her left shin. Suspecting weakness in the bone, doctors ordered a density scan. The results were worrisome. Detweiler says the doctors told her she was on the "very lowest end of having a normal bone density." The diagnosis: female athlete triad syndrome. Detweiler was surprised to learn she wasn't eating enough to fuel her training regimen. As an athlete, doctors and nutritionists say, she needed more food variety and more calories — three snacks daily, as well as bigger meals. Matzkin says anytime a young female athlete comes to her office with shin splits or fractures, she now asks about nutrition and menstruation. "We may be able to identify the root cause of bone mineral density problems," she says, and patients can be helped early to chart a new course in eating. It's not just about eating enough, Matzkin says. It's also about eating the right things — like fruits, vegetables, protein and foods rich in calcium and vitamin D. It's critical to build bone when you can, she says, because there's literally a countdown to how long women have to build strong bones. "We can only really build it up to about age 25," she says. After that, because of hormonal changes, women in particular lose bone density bit by bit every year. "If you can start at a higher level," she says, "then you're going to do better." Young athletes like Detweiler, who have already lost bone density, can rebuild some bone, Matzkin says. But "they'll never get back to where they might have been." Today, Detweiler is 19 years old and eats a healthy diet. She credits Jessica Buschmann, a registered dietitian at Nationwide Children's Hospital in Columbus, Ohio, for helping her achieve that. Buschmann says many of the athletes referred to her train for hours a day, every day. As a result, she says, it's not uncommon for these young athletes to need as much as 3,500 calories a day — which can seem scarily high to a teenage girl worried about body image. And that, Buschmann says, is her challenge: to convince these girls that eating too few calories puts the body at risk. She tells them she'll say the word "calorie" only once and then switch to other words like "energy" or "fuel." "That's truly what it is," she says — energy for your muscles and brain to make sure you're physically and mentally strong enough, and have enough stamina to optimize workouts and training. Detweiler embraced Buschmann's diet plan of increased calories: three solid meals a day plus three snacks. She still enjoys peanut butter sandwiches for lunch, she says — but now she eats the bread crusts, too. She soon started menstruating regularly. Her latest bone density scan also shows improvement. Best of all, Detweiler says, after starting on Buschmann's regimen, she started feeling better than ever — and had her most successful track season ever, too.